We'd like to give you a quick overview of our site, as we have a considerable amount of valuable information which you can quickly utilize. The following information will make it easy for you to find your way around and learn as much as you desire. Millions of entrepreneurial business owners, giant multinational corporation, and even governments are routinely involved in bartering efforts. They do so for one reason�it's profitable! Barter, in its many forms, is one of the world's fastest growing ways of doing business. The degree of sophistication certainly varies widely among these groups, as you will see when you compare the three levels of barter we report on. One emerging force in today's business world is a growing movement we refer to as the commercial barter industry. It encompasses about 600,000 companies involved worldwide that barter their products and services through trade exchanges and corporate barter companies. From The Desk Of...�Weekly commentary by Bob Meyer on the barter marketplace. Back Issues�Comments about the magazine from subscribers, as well as photos of all 64 back issues of BarterNews. Consulting Services�Take advantage of 30-year veteran Bob Meyer's extensive and unbiased knowledge of the commercial barter industry and the people within it. Entrepreneur's Package�For the newcomer to barter Meyer offers straight from the shoulder advice to get you off on the right foot towards achieving successful, profitable trading. CE Newsletter�The Competitive Edge newsletter is a valuable service for trade exchange owners with a vision to encourage trading among their members. It is researched and written monthly, and professionally produced. This marketing tool has been used by the industry for 21 years. FastStart Programs�The FastStart Programs I & II have been compiled and published by BarterNews with the purpose of aiding the business owner in understanding and utilizing barter on several levels. The FastStart programs offer little known step-by-step techniques for businesses of all sizes. Each program includes a one-year consultation with Bob Meyer. Program I is a comprehensive in-depth look at how the small to mid-sized business owner can use barter to generate greater profits and cut costs. Meyer has personally used these techniques for 28 years trading on both a direct and indirect basis. Program II is a thorough explanation, with examples, of how corporate barter works for major corporations wanting to rid themselves of slow moving inventory. It also includes complete information on EITF 93-11 , necessary for structuring a viable corporate barter transaction. Our Order Desk contains a form for all products presently available online. We have a secured server and use Authorize Net as our gateway. Affiliates�Listings of companies who have advertised in BarterNews. Banner Ads�Information about placing a banner ad on the website. First Time Visitors�This section gives you, our valued visitor, a quick overview of our entire site. Countertrade Section� Countertrade, which is usually done by major corporations and governments at the highest level, is addressed in this section. It is generally conducted on a direct basis between principals, with assistance from intermediaries such as banks. The excellent articles in this section will increase one�s understanding of this sophisticated international business-tool. 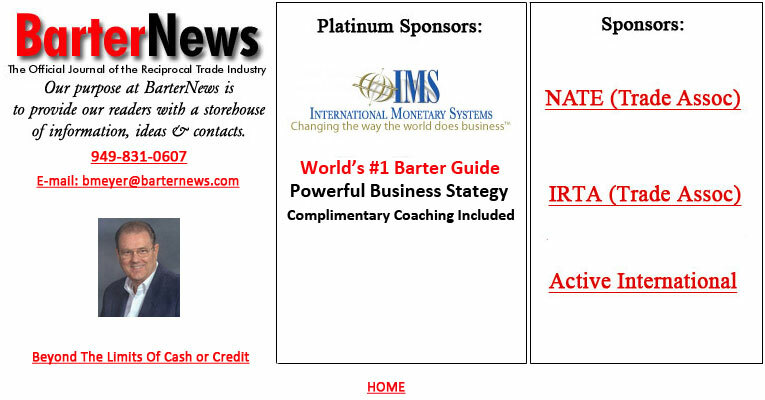 MarketPlace�Here you�ll find a listing of various barter companies that offer their members and prospects the monthly Competitive Edge newsletter. To obtain a free copy of the newsletter, contact the trade exchange nearest you. Global Barter Companies�This section lists barter companies outside the United States. Click on the name of the country to be directed to a listing of barter companies in that country. For Canada and Australia there is a map with more detailed information. Sponsors�This page has click-through logos of our site sponsors, which also are found above the navigational bar on every page of our web site. These are some of the finest companies and organizations in the commercial barter industry. We recommend that you contact them if you have an interest in their services and how they can help your business. 2005 Archive�All weekly published issues are provided in each year�s archive for your use and edification. 1999 Archive�Beginning with September 1999, when we first began publishing this weekly newsletter service.